Freundliche Mitarbeiter alles wird stets sauber gehalten! Man wurde sofort aufgenommen, als würde man schon ewig dazu gehören. Komme auf jeden Fall wieder her! The hostels location is a short walk (15 min) away from the city center. The hosts are very friendly and help you wherever and whenever they can. Breakfast includes the usual amount of opportunities you have in most of the hostels - nothing special but quite solid. The atmosphere with nice bedrooms and a incredible big and beautifully furnished chillout-area is pretty great! I would recommend this hostel highly to anyone who want's to stay a night in catania and is in need for a cheap bed. We had a great stay. The staff is really friendly and helpful. The room were nice clean and spaces. The bed was comfortable. The only thing we can criticize was the big mold problem in the bathroom, which resulted a bad smell. I had a very nice stay in the Eco hostel. The rooms were clean and I could sleep very well. It was very familiar and easy to meet other people. In the following points I was disappointed: - The bathrooms were moldy. - The staff was not really helpful and competent when I asked for a tour to Etna. At the end they booked a tour for me but this tour was really overpriced. Here it is better to organize the Etna tour by yourself. 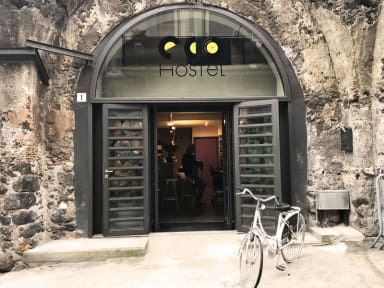 It's a nice small hostel at the fringe of the historic center of Catania. 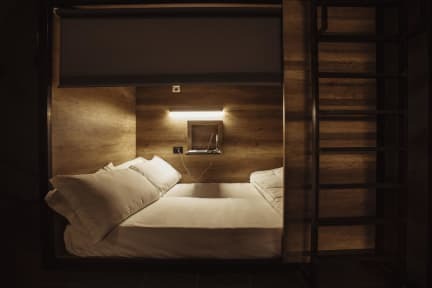 The beds are big and comfy and everyone sleeps in theire own little "box" with a curtain, a light and two USB chargers. It's pretty clean but there is only one real toilet, the second toilet is a handicapped one with no toilet seat. There is a big common area with sofas, a ping pong table and more. The breakfast is great (for a hostel), there are cereal, yoghurt, sweet pastry, toast, cheese, milk and (very sweet) juice. Das Eco ist ein modern eingerichtetes Hostel. Es hat einen Aufenthaltsraum, sehr positiv zu erwähnen sind die Betten! Mit den rollos, kann man trotz 8er Zimmer auch mal für sich sein, die Mitarbeiter sind sehr freundlich und man ist in 20 Minuten zu Fuß an catania Centrale und nur ein paar Gehminuten vom Strand und Zentrum entfernt. Die Bäder sind leider total verschimmelt! Frühstück okay. Anders, wie auf den Bildern, hat nicht jeder einen safe und Möglichkeit sein Gepäck zu vertrauen. Das Bett im Sechsbettzimmer war sehr komfortabel, incl. Rollo. welches Privatsphäre ermöglichte. Leider gibt es keine Locker. Die Luft in den sanitären Anlagen war - mangels Fenster - sehr schlecht, so dass Schimmel an den Wänden entstanden ist, obwohl alles noch relativ neu wirkt.